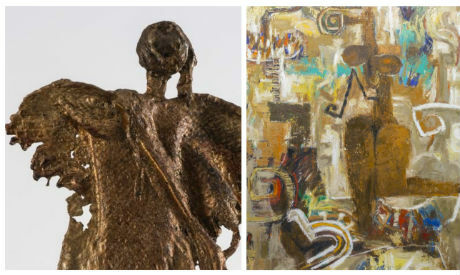 Ubuntu gallery will open two exhibitions in parallel this week: Rifky ElRazzaz's painting exhibition titled Cradle of Charm on the ground floor, and Halim Yacoub's sculpture exhibition on the first floor. ElRazzaz is a well-known Egyptian painter. Born in 1958, he finds inspiration from the landscape and ancient history to produce large paintings of subjects derived from Ancient Egyptian art. His abstract work is geometric and two dimensional, as if echoing Ancient Egyptian murals and drawings. His work can be found in the headquarters of UNESCO in Paris, and was exhibited both in Egypt and abroad many times. Yacoub is an Egyptian sculptor. Born in 1937, he graduated from the Faculty of Fine Arts at Helwan University, in 1960, he completed a Diploma at the Fine & Applied Arts Academy in Zurich in 1967. He works across different mediums that range from ceramics, pottery and metal cast sculptures, with works in décor and design. Between 1981 to 1985 he created seven public metal statues in Jeddah, Saudi Arabia, together with the artist Salah AbdelKarim.